There are 44 posts filed in Research (this is page 2 of 4). I have continued with the structure and firts contents of two papers and one special issue proposal. I have submitted a contribution to the European Data Forum 2013. I have not made any relevant progress in developing tasks but I have being refreshing my know-how on Python. Expertise ranking algorithms (some articles from the next Google Search), these two last activities are just for own-interest. I have started with the structure and firts contents of two papers and one special issue proposal. I have also completed a workshop proposal for the 9th ACM International Conference in Cloud and Autonomic Computing. I would like to leave the link to an article about “How to review a paper“, an excellent guide to evaluate your reviews and take into account your responsibilities as reviewer. I have not made any relevant progress in developing tasks but I have being refreshing my know-how on R.
I have finished the evaluation of alumni in Health Information Systems and I am very proud of the marks and the work carried out by student during the last months. I have some links of their works building mashups but I prefer do not leave here the links due to privacy issues. An ontology-driven approach to self-management in cloud application platforms. Modelling Feedback Control Loops for Self-Adaptive Systems. The main outcome of this work has been an small presentation about how to process Big Data applying the Lambda architecture, more specifically adding semantic to this process. It is a just a proposal and first thinkings but I will do my best to debug and design the whole process. I have made some progresses in the article about the experience publishing the “Webindex” as Linked Data and I have also planned the potential articles for this year and their contents. I have finished the evaluation of Health Information Systems in Nursing and Physiotherapy course at the University of Oviedo. They have developed very good works applying Web 2.0 concepts for building mashups in the Health sector, I am very proud of all students. My new apartment in Thessaloniki is located in Mitropoleos St. I have my Tax ID, Social Security ID and other “official” stuff. I have a Greek phone number. I have a new account in Alpha Bank. As you may know I am starting a new stage in a new country and institution. Now I am a Marie Curie Experienced Researcher (Postdoc) working at SEERC in Thessaloniki, more specifically in the RELATE-ITN FP7 project. My research will be address some topics such as stream reasoning, cloud computing, big data, etc. to create a system for monitoring QoS in cloud computing environments and service oriented architectures. As far as I know the objective is to get information about applications on the cloud and verify that the current status of different variables are aligned to SLAs so it is necessary to continuosly gather data from applications, promote to an existing knowledge-base and check restrictions through reasoning processes for finally making decisions such as new provisioning, etc. I have made a simple Python prototype to partially transform the Webindex in DSPL. The result can be found here. It just is an small example of consuming Linked Data. I have integrated Git, Heroku and Travis for creating a quality development environment as Labra suggested and I have to say it really works fine! I have downloaded, compiled and deployed the current version of Apache Stanbol. This is more or less what I have been doing this first week, I think I have improved and refreshed part of my know-how and I have also designed a first version of “A semantic-based lambda architecture for QoS Management in Cloud Computing and Service Oriented Architectures” that I will present on Tuesday. I was creating my profile at Google Scholar and I could add some of my publications (it is not yet the complete list but most of them are now available). I have also created a dashboard in Scoop.it to track and curate contents about some of my research interests such as cloud computing, stream reasoning, computational social choice theory, opinion mining or sentimental analysis. Our try to get funding and create a new start-up will have this week a new opportunity in the contest organized by CEEI Asturias. There are several participants with excellent ideas that are very good rivals. This is our flyer in which the approach is explained (it is only available in Spanish). We hope to have good news on Wednesday! Anyway we will continue working on this project to change the journalism realm! On the other hand, I took advantage of visiting this great country to take a look around Lima and I could take some pictures, you can find the album at Flickr. I am really excited with my invitation to be speaker at the 1st International Congress of Systems Engineering and Computation within Universidad Peruana de Ciencias Aplicadas. I was invited by Prof. Dr. Carlos Raymundo through my colleague Prof. Hernán Sagastegui Chigne. I will be the lecturer on Wednesday and Thursday of the next week (7th and 8th of November) and the talk will be about “Researching in Semantic Web Technologies”, you can see the full schedule here. Business Model Generation: A Handbook for Visionaries, Game Changers, and Challengers. This book has been written by Alexander Osterwalder and Yves Peigner. It clearly states some points in which companies should be focused to improve their competivity and results. It also includes examples of regeneration of business models and taking into account the current economic situation I consider it should be considered as “the bible” for entrepreneurs. Apart from the “business” view of this book other efforts have emerged applying this approach to other contexts, for instance to check your career and value as individual. The BusinessModelYou community has created a specific book entitled as “Business Model You: A One-Page Method For Reinventing Your Career” by Timothy Clark, Alexander Osterwalder and Yves Pigneur. This book is not just for re-inventing your career but to asses your value! 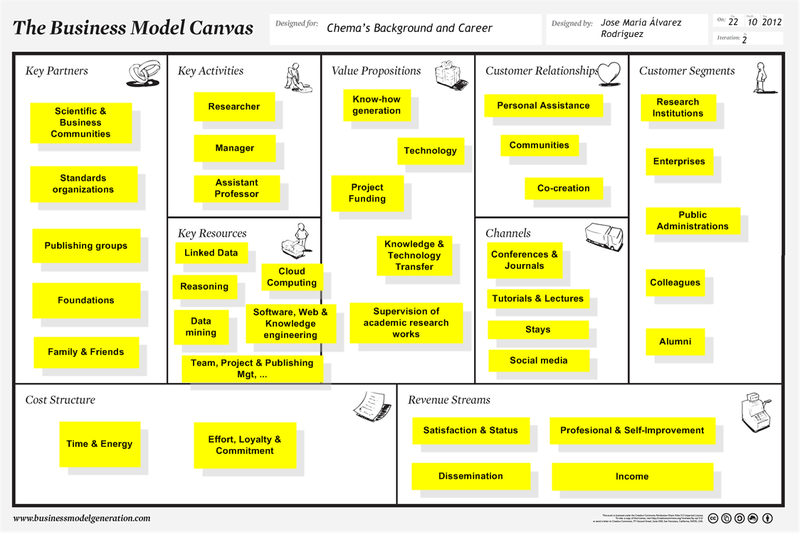 There are also a lot of tools to create your own canvas (the key-piece to create your business model. I firmly believe this technique is the key to identify your talent, value and potential that is why I strongly encourage you to download a template and create “Your Own Business Model”. I leave here my own business model. If you have any doubt please do not hesitate to ask me! We are human-being, the value is our talent not hours! Last weeks I have reviewed some of the existing works trying to mix semantics and cloud computing to improve some of the key-processes in a cloud environment. QoS and resource provisioning are two of the main processes that are supposed to take advantage of an intelligent decision support systems to dynamically adapt client requirements to cloud resources. According to the different types of cloud (SaaS, PaaS and IaaS) the use of formal models and knowledge bases can help to take decisions in different ways: prediction of resources, adjustment of “pay-as-go”, etc. Among other works I would like to leave here a list of relevant papers, etc. that I consider essential to understand the underlying problems, technology, current efforts and approaches to tackle them. LARGE-SCALE LINKED DATA PROCESSING: CLOUD COMPUTING TO THE RESCUE? I will continue updating this post and the references but I think it is a good starting point to check all related works in this area. Moreover I had collected some papers related to Map/Reduce, SPARQL and more in the ROCAS project wiki. This week I have started a course about Scala teached by Martin Odersky (the creator of this programming language). The course is basically focused on Functional programming with Scala and it reminds me my first steps in this paradigm when I was student of Labra‘s course “Functional and Logic Programming” in which I learnt some portions of Prolog and Haskell. After some years using Java and encouraged by Labra I enrolled in this new language (I had performed my first steps in Scala some time ago but without specific objectives). The learning methodology is very easy: you have to follow and watch some video lectures and after that you have some assingments to be completed in the a fixed schedule, if you complete all assignments you can obtain a certificate! This is only to demonstrate how a good use of tools and programming techniques can ease the coding! Last Tuesday I was interviewed by RPA about the participation of the WESO Research Group in this project. It was my first apparition in the radio and I believe the result was pretty good. You can listen the audio here. Moreover our head Labra was interviewed in other media such as newspaper and other radios and these contents can be accesed via the official communication portal at the University of Oviedo. On the other hand and following with the Webindex it is my intention to provide data and methods to calculate values using R. I think this is a real way to open and encourage the reutilization of data, at least in statistics. Finally, I am also involved in my distributed reasoner and preparing some proposals to mix computational linguistics, computational social choice theory, etc. I will update the blog with my outcomes. I also started this week to teach “Software Design” with my colleagues Benjamín López, César Acebal and Raúl Izquierdo, I am very excited with this topic because I love design patterns, software architectures, etc. I hope to do my best!